We are now just 8 days away from the U.S. premiere of Zack Snyder’s MAN OF STEEL and even though we got an excellent 13-Minute Featurette and what we thought was our final trailer, the marketing department has surprised us today with a brand new trailer brought to us by Nokia. This one brings us little in the way of dialogue only opening and closing the trailer with Jor-El (Russell Crowe) speaking. We get to experience more of Hans Zimmer’s amazing score and see a lot more action including Superman (Henry Cavill) and General Zod (Michael Shannon) exchanging blows and making a mess of downtown. One thing I want to point out is at around the 1:38 mark, we see more of the scene that we have been teased where Superman is being swallowed up by a mountain of skulls and now we see that he is wearing an all black version of his suit. Many have speculated that this is some sort of hallucination, but it is intriguing none-the-less to see how this will actually play out on screen. So give the trailer a look over (ok, we know, we know, you are going to watch it several times in a row) and then let us know what you think in the comments below. MAN OF STEEL is directed by Zack Snyder and stars Henry Cavill, Amy Adams, Michael Shannon, Kevin Costner, Diane Lane, Laurence Fishburne, Antje Traue, Ayelet Zurer, Christopher Meloni and Russell Crowe. SYNOPSIS: A young boy learns that he has extraordinary powers and is not of this Earth. As a young man, he journeys to discover where he came from and what he was sent here to do. But the hero in him must emerge if he is to save the world from annihilation and become the symbol of hope for all mankind. Henry Cavill plays Superman in director Zack Snyder’s “Man of Steel.” The film also stars Amy Adams as Daily Planet journalist Lois Lane, and Laurence Fishburne as her editor-in-chief, Perry White. Starring as Clark Kent’s adoptive parents, Martha and Jonathan Kent, are Diane Lane and Kevin Costner. Squaring off against the superhero are two other surviving Kryptonians, the villainous General Zod, played by Michael Shannon, and Faora, Zod’s evil partner, played by Antje Traue. Also from Superman’s native Krypton are Lara Lor-Van, Superman’s mother, played by Ayelet Zurer, and Superman’s father, Jor-El, portrayed by Russell Crowe. Rounding out the cast are Harry Lennix as U.S. military man General Swanwick, as well as Christopher Meloni as Colonel Hardy. 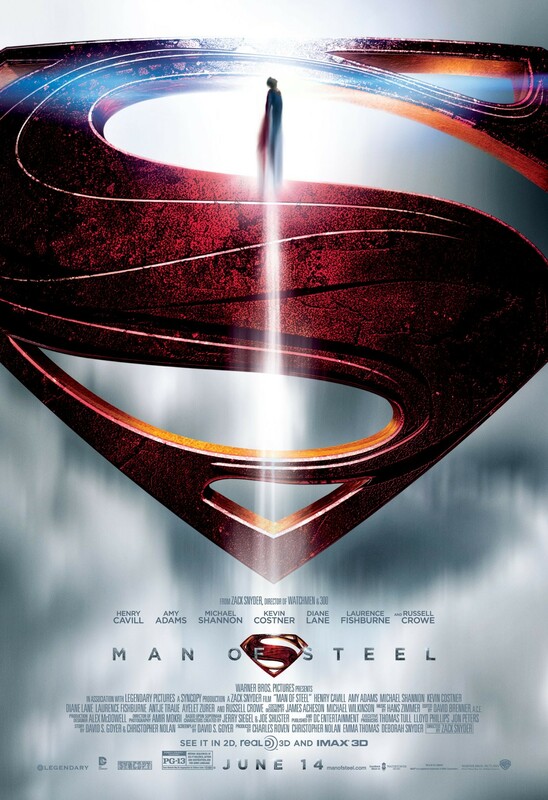 MAN OF STEEL is set to soar into 2D, 3D and IMAX 3D theaters on June 14, 2013. Jim is an avid movie enthusiast, representing the general movie going audience, looking at movies for their entertainment value as opposed to their critical weight. He enjoys the escapism that movies provide. He is a fan of all genre's of movies, but gravitates toward comic-based movies, summer "popcorn" flicks and over-the-top comedies as his preference.